In the closing verses of Hebrews 5, the author of this great letter warns his readers against apostasy, against straying from the faith: About this we have much to say, and it is hard to explain, since you have become dull of hearing. For though by this time you ought to be teachers, you need someone to teach you again the basic principles of the oracles of God. You need milk, not solid food, for everyone who lives on milk is unskilled in the word of righteousness, since he is a child. But solid food is for the mature, for those who have their powers of discernment trained by constant practice to distinguish good from evil. (Heb. 5:11-14) The author of Hebrews has much he would like to tell the recipients of this letter. There is much knowledge he would like to impart to them, so many important things they need to learn. Unfortunately, what he wishes to communicate is “hard to explain” not because it is obscure or difficult to understand, but because the people have become “dull of hearing.” They are not stupid people and are not intellectually inferior, unable to grasp such truths. The reason he cannot relay these important truths is not because of what these people are by nature, but of what they have become (2). There is much the author would like to say, but he cannot and will not because of the spiritual immaturity of the people to whom he writes. They lack understanding, and they lack discernment. The recipients of the letter to the Hebrews are not new Christians or recent converts, for the author says that by this time they ought to be teachers. This is not to say that they all ought to be ministers or preachers, but that they should all be sufficiently mature so they are able to understand and to teach others the basics of the faith. Sadly, though, they still have not understood the basics themselves. They do not have the childlike faith Jesus so values but a childish, immature faith. In this way they are like so many Christians since them. Richard Phillips writes: The recipients of this letter were like many Christians today who think that theology is a waste of time. What difference does it make, people ask, whether God is a Trinity or not, whether Christ’s righteousness comes by imputation or infusion, and whether regeneration comes before faith or after? What is important, they say, is that we get along with each other. Then they cite passages commending a childlike faith, as if that were the same thing as a childish faith, that is, one that is indifferent to or ignorant of the Word of God(3). We live in an age where too many who profess to be Christians rarely consider their spiritual maturity – an age when many consider spiritual immaturity a mark of authenticity, and when people associate doubt with humility and assurance with pride. Far too many people consider sound theology the mark of a person who is argumentative and proud. Far too many people are just like the audience to whom Hebrews is addressed. This letter draws a clear line connecting a lack of discernment with spiritual immaturity so that those who lack discernment are those who are spiritually immature. Scripture makes it plain: if you are not a person who exhibits and exercises discernment you are not a mature Christian. My wife and I have been blessed with three children and often marvel that they have survived through infancy, for we have seen them put the most horrible and nauseating things in their mouths (things my editor will, wisely no doubt, not let me mention in this book!). Children have no understanding of what is good for them and will sample anything. Their mouths are constantly wide open, eager to taste and to eat anything that looks good to their untrained eyes. It is only with maturity that children learn what is truly good for them and what is not. Only with maturity will children learn that what looks good may not truly be good. Children need to learn to differentiate between what will hurt them and what will make them healthy. Eventually they learn to discriminate; they learn to discern. In the same way, mature Christians have learned to differentiate between what is pleasing to God and what is not, between what is consistent with Scripture and what is not. The Bible places great emphasis on spiritual maturity because, like children, immature believers are prone to sample anything. They are attracted to what looks good to their untrained eyes. Only as they grow in maturity are they able to differentiate between what pleases God and what does not. Because of this there can be no growth without discernment. My wife and I have learned something else about children: children hate to be called children. Babies hate to be called babies. They don’t like to be known as immature or childish, even when they clearly are. Every little boy wants to be a big boy. Every little girl wants to be a woman. God has somehow built into us a desire to mature. Every person wants to feel mature and grown up. When the author of Hebrews describes his readers as children he is not paying them a compliment, and he knows that they will be insulted. He hopes to show them their desperate condition and to impress upon them how serious their spiritual condition is. God demands and expects maturity, and maturity is inseparable from discernment. A Christian cannot have one without the other. A lack of discernment is given as proof of spiritual immaturity, but this is not all. Those who are not discerning may also be those who are backsliding, whose faith is diminishing rather than increasing. “For though by this time you ought to be teachers, you need someone to teach you again the basic principles of the oracles of God. You need milk, not solid food, for everyone who lives on milk is unskilled in the word of righteousness, since he is a child” (Heb. 5:12.-13). While the subjects of this letter should have been growing in their faith, progressing from milk to solid food, they were instead moving backwards, returning to baby food. As children grow and mature, they begin to be able to eat and digest solid food. Most children are weaned quickly and encouraged to enjoy food more substantial than mere milk. Even while they are still tiny, children long for substantial food. It is good and natural that they desire that which will sustain them more than milk. We would not consider a child healthy who, at six years of age, still drinks only milk, for that child would be weak and sickly. The same is true in the spiritual realm. A person should pass quickly from spiritual milk to solid foods, from the basics to what is more advanced. A person should hunger to quickly learn and understand what is elementary and should soon long for what is more advanced. This is a sign of maturity and the mark of one who has been truly saved. On the other hand, a person who regresses from solid food to milk is a person who is desperately unhealthy, and who will soon wither away and perish. The recipients of the letter to the Hebrews were regressing rather than progressing in their faith. There had been a time when they were able to hear what the author was so earnest to share with them now. Sadly, they are no longer at such a place. Their lack of discernment has caused them to lose ground. They are moving backwards rather than forwards. They are backslidden. Solid food is a long way off from these people, for “solid food is for the mature, for those who have their powers of discernment trained by constant practice to distinguish good from evil” (Heb. 5:14). Until these people learn to practice discernment and to do so constantly, they will not be able to handle solid food. Until they practice discernment and learn to distinguish between what is good and what is evil, they will continue backsliding. Thus a lack of discernment is not only a mark of spiritual immaturity, but also a mark of those who are backsliding. Those who have professed faith in Christ cannot backslide indefinitely. Sooner or later it will become clear that they are not believers at all and surely never were. The Bible does not tell us if the recipients of the letter to the Hebrews continued to fall away or if God graciously used this letter to draw them back to him. But Scripture tells us elsewhere what happens to those who harden their hearts against God, rejecting his good gifts. Romans 1:28-32 is a damning indictment of the unregenerate human heart. It shows with terrifying clarity the evil of which humans are capable. These verses make plain the extent of the sinfulness of those who have rejected the true God in favour of false gods of their own making: Since they did not see fit to acknowledge God, God gave them up to a debased mind to do what ought not to be done. They were filled with all manner of unrighteousness, evil, covetousness, malice. They are full of envy, murder, strife, deceit, maliciousness. They are gossips, slanderers, haters of God, insolent, haughty, boastful, inventors of evil, disobedient to parents, foolish, faithless, heartless, ruthless. Though they know God’s decree that those who practice such things deserve to die, they not only do them but give approval to those who practice them. These verses ought to strike terror in the heart of all who forsake God and ought to cause us all to pause and acknowledge the depth of the evil that inhabits the hearts of men. As men turn from God, he gives them up to do those things their hearts, filled with evil, cry out to do: envy, murder, hatred, gossip, boasting, and all manner of evil. And in the midst of this list is one word that seems almost unexpected (4). God gives people up to foolishness. Most Bible translations render this word as “without understanding.” One, the New King James Version, translates it as “undiscerning.” Regardless of how it is rendered in English, this word points to a type of moral foolishness that should not be present in the life of one who considers himself a Christian. It points not only to the sinfulness of a lack of discernment, but to the inevitable conclusion that a lack of discernment, utter foolishness, is a mark of one who is spiritually dead and bankrupt. A complete lack of discernment or lack of concern for the discipline of discernment is a mark of spiritual death. It is categorized with sins that somehow seem far more serious. That a lack of discernment appears in this list seems shocking, but it shows just how much God values discernment. An absolute lack of discernment and a lack of concern for discernment is sure proof of spiritual death. We see also in 1 Corinthians 2:14 the dire consequences of ignoring discernment: “The natural person does not accept the things of the Spirit of God, for they are folly to him, and he is not able to understand them because they are spiritually discerned.” Those who are unsaved, who do not have the Spirit of God within them, are unable to be discerning. The ways of God and the truths of God are utter foolishness to such people. To lack discernment is to sin against God. It is an inevitable result of turning from him. It is easy to look at those who have turned from God and to look at their lustful and angry hearts and affirm that this is the result of their sin. When a Christian falls into moral sin he may well examine his life to determine how he has turned his back on God, but is the same true when he exhibits a lack of discernment? A wise pastor writes, “to willingly neglect the truth and to live with our eyes closed shut while good and evil stare us in the face is to sin against God, ourselves, our families, and our church …. Again, this is worth stating over and over again. It is the responsibility of every Christian to learn, to be discipled in the Word, so that we can know how to be discerning. To fail to discern is to walk in darkness” (5). 2 Phillip Hughes, Hebrews (Grand Rapids, MI: Eerdmans, 1977), 189. 3 Richard Phillips, Hebrews (Phillipsburg, NJ: F8CR, 2006), 177. 4 I am indebted to pastor Phillip Way for his series of articles called “Learn to Discern” (http://pastorway.blogspot.com/2006/06/failingto-discern.html). 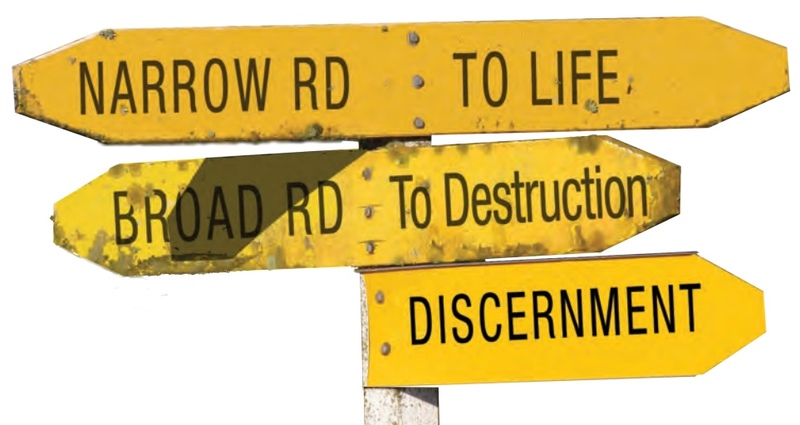 5 PhiIlip Way, “Failing to Discern” (http://pastorway. blogspot.com/2006/06/failing-to-discem.htmI). Tim Challies, “The Discipline of Spiritual Discernment” (Crossway Books, Wheaton, 2007), pp. 22-7. Challies.com.